Most Beautiful Girl in Lagos (MBGL) 2015 is endorsed by the Lagos State Government, aimed at developing, growing and supporting today's women through the pageantry. 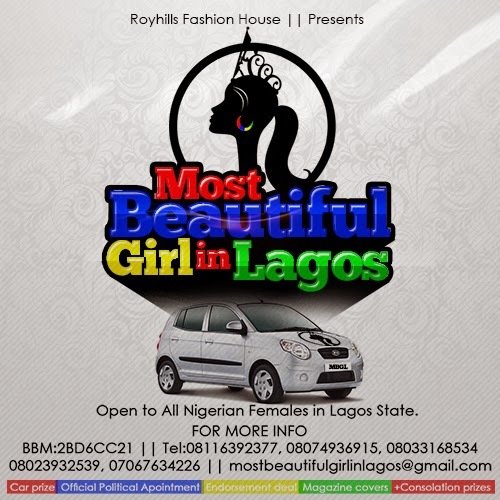 Most Beautiful Girl in Lagos is organised by Royhill Fashion House, the organisers of Lagos Fashion Meniac, Lagos Fashion Awards, Africa International Model Search, Lagos Fashion Exhibition and Runway on the Street. Speaking on the Most Beautiful Girl in Lagos, CEO Royhills Fashion House, Roy Edozie in his words says; The Most Beautiful Girl in Lagos (MBGL) will prepare contestants to stand firm in the society as women who are aware of the power that is derived from fulfilling their purposes, and who uses that power to impact the welfare of humanity. To stand a chance to win an official car, become Lagos Change Ambassador for Woman, Brand Face for PELS International Skin Care, One Year Wardrobe from Fabrique by Fabz, Free designers’ foot wear from Philadelphia Boutique amongst other notable prizes, the beauty pageant is opened to all single ladies in Lagos State within the age range of 18 – 28 years and must be up to 5.6feet tall, Mr Edozie concluded. The Public Relations person, Adeyinka Mayowa stipulated that, the Most Beautiful Girl in Lagos beauty pageant is to re-brand all beauty pageants, also to be a mentor to all other beauty pageants. The world class event is set to showcase nothing but the best to the world. All interested ladies should read the terms and conditions and register for MBGL 2015 at http://delotech.com.ng/form/.